The heart and soul of the 2013 Audi RS6 Avant is the 4.0L twin turbocharged V8 engine that churns out a whopping 560 horsepower and 516lb-ft of torque. Couple that output with the standard Quattro all wheel drive system and a sport tuned 8-speed Tiptronic automatic transmission and you have yourself a sport wagon that will rocket from 0 to 62 miles per hour in just 3.9 seconds while hitting a standard top speed of 155 miles per hour. Add the Dynamic Package and the RS6 Avant top speed jumps to 174 while the Dynamic Plus Package bumps it up once more – this time to 190 miles per hour. That is one seriously fast wagon. Best of all, due to some high tech goodies like automatic start/stop and cylinder deactivation, the new RS6 Avant achieves an average fuel economy figure of 24 miles per gallon. Finally, the new twin turbocharged V8 is fitted with a dual mode exhaust system with flaps that open and close to optimize performance and sound. Helping the ensure that the 2013 Audi RS6 Avant handles as well as it launches, the Quattro all wheel drive system fitted with a torque vectoring program works with an adaptive air suspension system that can be adjusted for optimal handling when needed while providing a more comfortable ride under normal, everyday driving situations. The stopping duties are left to a high performance braking package featuring six piston calipers behind the front wheels and if the buyer wants even better performance capabilities – Audi offers upgrade goodies like a sport tuned differential package, a sport suspension setup with Dynamic Ride Control, Dynamic Steering Control, carbon ceramic brakes, a high flowing sport exhaust system and lightweight 21 inch wheels. The 2013 Audi RS6 Avant is set off on the outside by a unique aero package that adds an aggressive front fascia with massive intake openings that allow for plenty of air intake for the engine along with gobs of cooling air for the radiator and the intercooler system. This front fascia also adds an extra dimension of aggressive styling that leaves no question that this is a high performance sport model. Along the side, the flared fender openings are filled with 20 inch lightweight aluminum wheels while the deeper side sills work with the sport suspension to provide a much sportier stance. Staying true to the luxury nature of the Audi brand, the RS6 Avant features a scant amount of chrome along the sides around the windows and on the roof rails. Finally, the rear end of the new RS6 Avant is set off with an integrated lower diffuser that encloses a set of massive polished exhaust tips, a roof mounted spoiler and the simple RS6 badging. On top of all of those features that are unique to the RS6 Avant, this sporty wagon also comes with the basic items that make the current Audi lineup so sporty like the LED projection headlights and the sharp LED tail lights. Inside, the 2013 Audi RS6 Avant packs an incredibly high tech looking layout featuring carbon fiber finishes on the dash, door panels and along the center console with leather covering – well – pretty much everything else. The sport inspired front bucket seats are clad in black leather with contrasting white stitchwork that forms a honeycomb design and even the rear passengers get the sporty ride as the RS6 Avant includes standard rear sport bucket seats (although a standard bench with three seating positions is available). 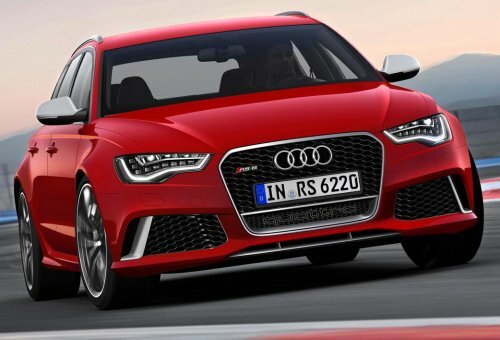 Audi’s announcement of the 2013 RS6 Avant did not include launch dates or pricing but considering that it is listed as a 2013 model year vehicle – we should expect to see this awesome sport wagon in dealerships soon. When it does arrive, this new top of the line German sport wagon could pose a serious challenge to the Cadillac CTS-V for the title of the best performing “wagon” in the US market. Click any of the thumbnails on the right side for a closer look at the new 2013 Audi RS6 Avant!